Opie Taylor: Pa? You know what I figured out about girls? 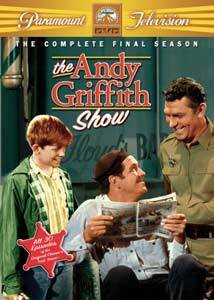 After seven successful years, The Andy Griffith Show winds it up in its eigth and final season, but not without spawning two spinoffs in Gomer Pyle, U.S.M.C. and Mayberry, R.F.D., whose pilot forms the final episode. The show's popularity was never stronger, and this last season gained its highest ratings ever. The most obvious changes to the Mayberry cast are the absence of Hal Smith as Otis and Howard McNear as Floyd the barber, whose failing health forced him to leave the show. In his place is Paul Hartman as town repair man, Emmett Clark (husband of Bea's friend Martha, played by Mary Lansing), who, according to the story, bought out Floyd's shop when he retired. Like many of the citizens of Mayberry, Emmett isn't really all that capable at his job, often deferring to a hammer to deal with his tasks rather than the appropriate tool, but he fits in well as a new character. Like many of the previous years, this season opens with a father/son episode, as the now thirteen-year-old Opie gets set to ask a girl out for the first time in his life, a young Morgan Brittany (of Dallas fame) as Opie's First Love and "touchy subject," Mary Alice Carter. Andy is called upon to extoll some fatherly advice when Mary Alice cancels at the last minute. When Opie Steps Up in Class after being persuaded to attend a holiday camp with boys from a more affluent area, Andy needs to take a little of his own advice about fitting in with others. Opie learns the importance of the right to privacy when he and Arnold covertly tape record a criminal's confession (The Tape Recorder), and is growing up a little too fast when he joins a rock group (Opie's Group), leaving Aunt Bee to call in help against Andy's wishes. There's a lesson in responsibility at Opie's Drugstore Job. The town sheriff will be feeling the heat from more than just a sunburn when Helen discovers who he was with during Andy's Trip to Raleigh, and when he uncovers a disturbing fact about Helen's Past, Andy has a hard time keeping it a secret. It pays to keep healthy when you have Goober as a replacement in Suppose Andy Gets Sick, and Andy is in the hot seat as the deciding vote in The Church Benefactors. Fearing he won't be able to put his son through college, Andy opens a laundromat (Andy's Investment), but soon comes to realise that there is more to the business than he was prepared for. Trouble starts when Bee wins A Trip to Mexico and she becomes a clebrity (The Maybery Chef). After getting the call for jury duty, Aunt Bee takes her responsibility seriously, even if it means going against the verdict of her fellow jurors. There's a lttle bit of deception in the air when a suitor finds everything he's looking for (Aunt Bee and the Lecturer) and the sky's the limit when she decides it's time for Aunt Bee's Big Moment. Goober finds himself in over his head when he decides to buy the filling station (Goober, the Executive) with Andy and Emmett cosigning his loan, but even his new position as an owner has him feeling inadequate when he runs into an old rival, whose successes are flaunted (Goober Goes to the Auto Show). This episode is one of the finer when it comes to character exposition. Is there A Girl for Goober? Having exhausted the women in Mayberry, Andy and Howard suggest using a new computer dating service which nets some unexpected results after Goober's interpretation of the questionaire. Howard, the Bowler finds himself the center of attention while subbing in on the Mayberry team. When the new girl in town, Millie Hutchins (Arlene Golonka), catches his eye, Howard has to deal with an angry ex (Allan Melvin), and "happily ever after" may be a challenge when Howard and Millie decide to get married. After watching a travelogue on TV, he decides to quit his job as County Clerk and move to the Carribean in Howard's New Life. When his mother gets married to a man from Raleigh (The Wedding), Howard inherits the family home and soon has it set up a swinging bachelor pad. Emmett's Anniversary is causing him concern when Martha lets it be know that she is hoping for a mink coat. If that weren't bad enough, when he makes plans to head to Raleigh to find her one with waitress Flora (Alberta Nelson), his wife sees the two of them leaving and thinks the worst, leaving Andy to damage control. Emmett's Brother in Law convinces him to give up the fix it store for a new career as an insurance salesman. In a rather oddball installment echoing the cold war tensions of the era, Barney Fife (Don Knotts) returns to Mayberry where he is charged with finding a suitable location for a summit between a Soviet and American ambassador, which as luck would have it winds up being Andy's house�good thing Bee has the fridge stocked! With the series winding down, the final stretch introduces character Sam Jones (Ken Berry) who gains prominence in the leadup to the spinoff pilot for Mayberry R.F.D., which would carry forward for a three season run featuring many of the Mayberry cast before falling prey to CBS's rural comedy purge in 1971. In Sam for Town Council Andy, Goober and Howard pursuade farmer Jones to take a run against Emmett, who is determined to take over the recently vacated position on town council. Sam's young son Mike (played by Jodie Foster's little brother, Buddy) is being bullied at school so Opie volunteers to be his guardian, but when a new girl moves in next door, Opie's attention is distracted (Opie and Mike). The season finale finds Sam dealing with the unexpected arrival of an Italian immigrant family. Once again there is a good mix in the season, with each character getting their time in the spotlight. The writing remains fairly consistent throughout—there are a few lesser installments, but the high points even things out. Image Transfer Review: Image quality is very good throughout. Colors are well saturated and generally free of bleeding, though a few places show slightly poorer contrast or low level detail. There is the odd minor blemish, but nothing to get too concerned about. Another fine job from Paramount. Audio Transfer Review: Mono audio is clean and free of any major technical imperfections. Dialog is clear and easy to understand. No complaints here. Extras Review: The first disc has a pair of skippable trailers, the first being for Paramount's TV on DVD product including The Brady Bunch, I Love Lucy, Cheers, Gomer Pyle U.S.M.C, Hogan's Heroes, The Honeymooners, Police Squad, Wings, Sgt. Bilko, and Frasier. A Mission Impossible TV series trailer follows. Five chapter stops are included within each episode, and there is a "Play All" option. Packaging remains consistent with the theme of the show and include episode synopses inside each case. Although a few episodes seem a bit out of place, this final season continues to entertain in the established Mayberry tradition, and all of the principle characters have their defining moments. If you've gotten this far, there's no reason to miss this set. Recommended.